A 13-year-old American girl (Diane Lane, Unfaithful) attending school in Paris, France, meets and falls in love with a precocious French boy (Thelonious Bernard), who is also a huge fan of classic American movies. They both befriend Julius (Laurence Olivier, Rebecca), an old con man, and soon his fantastic tales of love and adventure take all of them to Venice, Italy, to the consternation of the girl’s parents. Once in a while, a movie with no great expectations comes along and catches audiences by surprise with its simple and charming storyline. 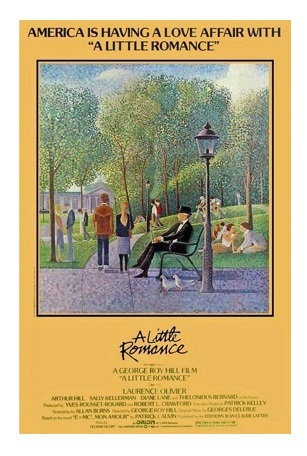 I think I could say with a certain degree of accuracy that A Little Romance is one of those films — a charming and sweet little film that earns the audiences’ laughter and tears in an honest manner. The movie is touching without being too sentimental, funny without relying on obvious slapstick, and absolutely enchanting without ever becoming coy or cutesy. I have always loved this film, and I’m not exaggerating when I say that A Little Romance, directed by George Roy Hill (Butch Cassidy and the Sundance Kid and The Sting), written by Allan Burns (TV’s The Munsters), is one of the most effective coming-of-age movies I’ve ever seen — it’s a complete delight from beginning to end! French composer Georges Delerue’s (Ghost Story) delightful and Oscar-winning compositions are a pleasure to listen to, and add immeasurable to the film’s whimsical atmosphere. Pierre-William Glenn’s (A Dry White Season) cinematography is great too. The cast is truly impeccable: Diane Lane and Thelonious Bernard are great as the two young lovers (it’s hard to believe that this is their very first movie). And then there is ‘Lord Larry’ Olivier shamelessly and deliciously hamming it up as the con artist who becomes the kids’ unlikely chaperone and matchmaker. There is also some fine support from Arthur Hill (The Andromeda Strain) as Lane’s understanding stepfather, Sally Kellerman (M*A*S*H) as Lane’s snobbish mother, Anna Massey (Frenzy) as a teacher, David Dukes (The First Deadly Sin) as an egotistical film director, and Broderick Crawford (All the King’s Men) as himself. A Little Romance is a sincere ode to innocence, first love, and all those little things that make life so special. It’s also a great homage to Hollywood cinema. For those of you that simply want to watch a good film, this is one of those few family films that actually deals with important issues — it’s a beautiful and delightful “little” movie. Color, 108 minutes, Rated PG. Excellent review! I’ve always enjoyed this movie for the exact same reasons that you mentioned above! Thanks! I’m happy that you like it too.